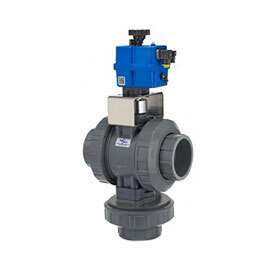 Actuated & Manual Ball Valves feature trunnion safety design and dual sliding seats for ultra-smooth operation and repeatable bubble-tight shutoff with an incredibly long cycle life. Available 2-way and 3-way, in 3/8″– 4″ sizes. 3/8″ – 4″ sizes in PVC, CPVC, Natural Polypro, PVDF with FKM or EPDM. 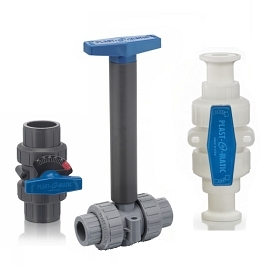 2-way and 3-way Valves feature trunnion design, dual sliding seats. Available with NPT, socket, BSP, Sanitary, and other connection types. 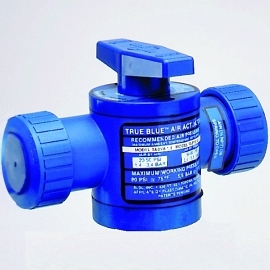 Options include Z-vent for sodium hypochlorite, Lock-out/Tag-out, Metering, Characterization, Stem Extensions, and Lateral Reducing connections. Premium models EBVB/TEBVB and brushless model EBVF/TEBVF provide automatic voltage sensing in high or low range, with standard manual override, position indicator, running lights, condensation heater and thermal overload protection. Options include Fail-Safe battery pack and 4-20 mA or 0-10 VDC electronic control. 3/8″ – 4″ valve sizes, 2-way and 3-way. Heavy duty model EBVC provides rugged, ultra-fast on/off cycling with standard manual override and position indicator. Specific AC or DC voltage must be specified. Includes mounting kit. Designed for easy field installation for 2-way valves; for 3-way valves consult factory. 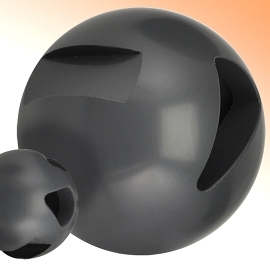 Sizes from 3/8″ to 4″ in PVC, CPVC, Natural Polypro and PVDF. Manual or Actuated: Electronic flow control via Plast-O-Matic Air or Electric Actuators with optional 4-20mA or 0-10 DC digital positioning. 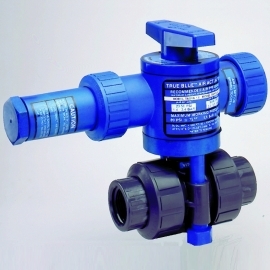 Manual flow control via Series MBVM Metering Manual Ball Valve. NOTE: Price must be added to manual or actuated valve list price.